All of our Industrial Spreaders feature three augers constructed of massive sectional flighting. Thrust bearing and nylatron sleeves on the drive side of the auger reduce stress and horse power requirements. Steep tank sides constructed from heavy gauge, rust resistant steel are just plain heavier than the rest! Hardened expeller jaws are easy to replace and less expensive than pivoting hammer systems. 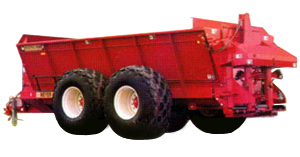 Adaptable to a wide range of trucks and also terra-gator systems. Drive options include both PTO and hydraulic.